I didn’t always believe in the positive health benefits of MCT oil. Yet when I unintentionally consumed it, I felt great! Have you been skeptical too? Let's explore the benefits of MCT oil, what it is, and how to use it. MCTs are medium-chain triglycerides — a unique kind of saturated fat often missing from our diets. To quickly brush up on our chemistry, triglycerides are fat molecules comprised of a glycerol “backbone” and 3 fatty acid “chains” coming off the backbone. At least 2 of the fatty acids in MCTs are of medium length (6 to 12 carbon atoms, although sources differ). Because the fatty acids in MCTs are relatively short, MCTs are easier to digest than their more common counterpart, LCTs (or long-chain triglycerides). After consumption, the body breaks down MCTs into their component fatty acids, then sends these fatty acids directly to the liver. There, they are burned as fuel immediately instead of getting stored as fat. This means an increase in metabolism, potential weight loss, and an increase in both brain and body energy (source and source). Although I've known about MCTs for years, I figured we were getting enough of them through coconut oil. According to some, coconut oil is 62% MCTs. While coconut oil is excellently healthy in its own right, however, most of its MCTs are on the longer side. They're still considered medium-chain triglycerides, but they stay in the liver longer than their shorter medium-chain triglyceride counterparts. Does that make sense? 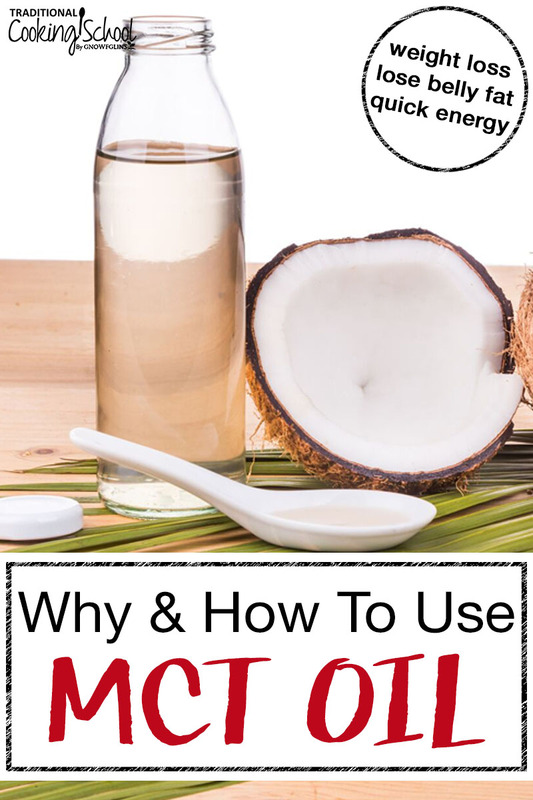 So if coconut oil doesn't really yield the best MCTs for energy and fat burning, where can you get them? Well, the shortest ones can be extracted from coconut oil and sold as MCT oil. Many advocates use specially formulated MCT oil in their morning coffee — skipping breakfast and fueling up simply through MCTs, which make the belly feel full. This is called intermittent fasting. It's gaining traction even among traditional food advocates for longer life span (source), improved brain function (source), increased transit time, recovery from cancer (source and source), and fat loss (source and source). I purchased a protein powder for my son made almost entirely of grass-fed beef. I blended it up for him with warm raw milk at breakfast time, and we both started drinking it. Immediately, I noticed a boost of energy. And over the course of 2 months, I noticed decreased belly fat! When I looked at the label of the protein powder again, I was surprised to see medium-chain triglycerides as the fourth ingredient. Light bulb! That's why it made me feel so good! Although I eat protein and raw milk in other ways, this was my best source of MCTs. For those of us with Hashimoto's or other thyroid disorders, energy is so important! When the thyroid is compromised, the body tries to protect itself, often by triggering a sort of hibernation instinct: eat more, gain weight, sleep more, exercise less (source). MCT oil causes the opposite effect — less belly fat and more energy! And while it alone can't treat Hashimoto's, it does boost thyroid function, providing increased energy and metabolic function. To learn more about the thyroid and how you can support it with nutrition, check out 7 Foods That Nourish Your Thyroid and 7 Foods That Are Making Your Thyroid Sick. Here's my favorite “bulletproof” recipe using MCT oil: Thyroid Anti-Inflammatory Energy Tea! According to this study, MCTs may help preserve insulin sensitivity in those with type 2 diabetes. And for those with gall bladder issues, MCTs are a great fat source because they don't require bile for digestion — their fatty acids go straight to the liver, instead. MCTs are antimicrobial (source and source). Studies also attribute an increase in immune function, relief from epileptic seizures, better exercise recovery, and a decreased risk of heart disease to MCTs. Finally, MCTs can be used to enhance endurance exercise, since the body is more apt to use free fatty acids than to pull on glycogen stores (source). This protein powder is delicious! I use it in ice cream, hot chocolate, and bulletproof coffee. I personally vouch for it, and functional medical practitioner Chris Kresser also recommends it for increased athletic performance or recovery. Regarding MCT oil, different companies offer different formulations. Bulletproof, for instance, emphasizes the 2 shortest-chained MCT fatty acids (caprylic acid and capric acid) in their products. These fatty acids are more expensive since they aren't as abundant in coconut oil, from which most MCT oil is derived. And yet, they arguably yield the most benefit. I prefer to source my MCT oil from Bulletproof. They also offer a range of products to fit different budgets and needs. I also like the MCT oil from Wild MCT for the quality, effectiveness, and integrity of their product. Update: since writing this post, Perfect Supplements came out with another great MCT oil. It isn't pure caprylic acid (C8) as Bulletproof is but it is certainly a great combo of caprylic acid and capric acid and is more affordable. Here's more info. Although the list price is $31.95 per 30-ounce bottle, you can get your price down to $20.12 per bottle by purchasing at least 6 bottles (automatic bulk discount of 30% OFF) —and— applying coupon code TCS10 at checkout to get another 10% OFF! Most products containing MCTs come in the form of a virtually flavorless oil. Take MCTs alone, blended into hot beverages, or added to smoothies or salad dressings. Wherever you'd use another oil! It's also said to be safe to cook with, although I've never tried it. Bulletproof coffee refers to the recent trend of blending MCT oil into one's morning coffee or tea. I highly recommend this, as it fully homogenizes the oil into one's beverage. It makes coffee or tea oh-so-creamy! Typically you combine 1 tablespoon MCT oil with 1 tablespoon grass-fed butter and blend it into coffee (see this recipe). You can also add sweetener, although not if you're intermittently fasting. I like to add gelatin as well, which creates a fine foam and also promotes gut health! Have you experienced the benefits of MCT oil? Do you have a favorite brand? Have you noticed an energy boost or decreased body fat? What was the name of the protein powder made with grass fed beef? Where can I buy the MCT Oil and what brand. Hi Terry, I recommend the Brain Octane Oil from Bulletproof (see the link above in the article) or Wild MCT Oil off of Amazon (there’s also a link in the post to this product). NOW has MCT Oil at Puritains Pride have you heard of this one? My daughter 17 was diagnosed with Graves disease when she was 11. She has been in remission for 3 yrs. We are suppose to go have her blood tested to see where she is. (praying she is still in remission) the Dr said she could go into Hypo thyroid. We are trying to see how we can help her and go natural. Any help would be great!! Hi Terry, that brand and product looks fine. Many blessings in your health journey with your daughter! I’m so glad you found TCS and the posts here about thyroid health (and there are so many on healing and wellness diets); may they help to meet your needs as you choose natural foods. Hi Robin I just started THM and was wondering the MCT oil you use? So far I’ve only used the THM brand. I completely trust Megan’s recommendations so may try one of those next time. Thanks, Robin, for adding the insight that it affects your sleep! That’s a good warning for others, too. So glad you’ve benefited from MCTs! Oh, thanks so much for this info! I’ve heard of the two acids…but didn’t know anything about this oil! Will have to try to get me some one of these days…if finances ever allow it!! Thanks for the links to them too!! I’ve gone to bulletproof, but they aren’t showing an MCT. They have an XCT, but that’s completely based on coconuts, not capryllic and capric acids. Which product specifically should we be looking for? Aw, Karen, apologies! I should have been more clear as they have given their products names that aren’t super easy to decipher. 😉 The Brain Octane Oil is their highest quality MCT oil, and my favorite choice. Does Ghee work in place of butter? First, do you and/or Wardee/TCS have any sort of financial or other beneficial relationship with the product manufacturers you’re endorsing? And second, if we are trying to lose hypothyroid weight, adding a spoonful of butter or ghee to our day seems counter-intuitive. Will you please explain why it’s recommended? Hi Mimi, sorry for the delay in responding. Regarding a financial benefit, I, as the author of this post do not; and I choose the products I recommend based on my research and experience. Traditional Cooking School makes a small commission on certain purchases made through links, which allows the blog to function. Regarding eating fat to lose fat, good question. It is sugar (and simple carbs) that the body stores as fat, (or fat consumed with certain carbohydrates). In the case of thyroid healing, fat, protein and complex carbs are all needed to balance blood sugar and to meet the body’s many needs. Fat affects hormone levels and helps to support brain function and mood. It also helps to lower inflammation and satisfy. I hope that helps. Are there vegetarian sources for MCT other than coconut oil? Yes, Desa. Palm oil is the other main source. I’m confused. I don’t understand how these ingredients (from Designs for Health – PurePaleo Protein Chocolate Dairy-Free Shake Powder with HydroBEEF Beef Protein) fit in with traditional cooking/eating: hydrolyzed beef, the other ingredients are: natural chocolate flavor, natural vanilla flavor, medium chain triglycerides, stevia leaf, and silicon dioxide. I don’t think my Grammy, traditional cook that she was, reached for the hydrolyzed beef and silicon dioxide. I’m not sure, either, where natural chocolate and vanilla FLAVORS come from. I’m not trying to be ugly or argumentative, I’m just trying to figure out how traditional this protein powder is. Thank you for any and all help that can be given. Thanks, M. Totally a fair and valid point of view! My “little” body (as I sometimes call it in its frailty) loves this product, and is quite sensitive in general. I tried it for my son who needed bolstering, (quite skeptical myself), because Chris Kresser uses it and recommends it for heavy workouts. My son’s history is complicated with food, and his body was quite drained with hard workouts despite the amazing and intentional diet we eat. No way would our great grandmothers have eaten it; and yet I believe the way the product is formulated offers good not harm to my body, benefits and healing. It is conscientiously assembled, if not as whole food sourced as we would prefer or demand. It doesn’t contain weird vegan products like pea protein powder or soy derivatives etc. The list of ingredients is short, well-sourced and intentional. Sometimes when our guts are unwell, there are products that act like supplements do, providing a concentration of one or more nutrients that we aren’t able to get enough of from food. For example, if someone has SIBO, their body can not absorb B vitamins well. So they need to supplement with B vitamins to get to the point where whole foods will assimilate properly. This is a worthy debate. Surely Dr. Natasha Campbell-McBride designed the GAPS Diet initially so food would heal, and supplements would be unnecessary and definitely secondary. But what she found through patients like me is that we needed the supplements, which sometimes have man-created ingredients (like silicon dioxide that have a role) to get well. Man-made caustic ingredients like antibiotics and formula created my gut problems and while mostly God-made foods like probiotics and whole foods can heal me, I am grateful for man-assembled B12 sublingual pills and prebiotics with ingredients like inulin that contains a few seemingly less desirable ingredients, because they’ve gotten me to that next level of wellness that bone broth alone wasn’t doing. I know a family (here in Eugene, OR where I live) that is very healthy, no food sensitivities; they live on land. Their whole lives embody traditional living. That’s the goal. But sometimes we reach for a “Paleo” supplement along the way to try and get ourselves there. That’s how I perceive this protein powder: a helpful supplement. In general I have been a proponent of zero protein powders. So it was a big deal for me to even buy this one. When we saw a benefit I became an advocate. I totally understand if you don’t wish to support the ingredients or product! Thank you for writing. I really do appreciate your perspective. And thank YOU for this detailed response. I appreciate learning about new things, so you’ve given me a lot to think about. Your energy boost probably came from the combo of protein and MCT oil, not just one of them. I started drinking Brain Octane MCT oil every morning in my coffee with a teaspoon of butter & a teaspoon of collagen. I love it! I started this 1-1/2 months ago & have noticed GAINING in my tummy & thighs. What is going on do you think? I have a small build & weigh 110 lbs but I certainly do not want to start gaining in my tummy & thighs. I am 53 years old. Do you think this has messed up my metabolism? Has anyone experienced the same as I have? Please update this with a note on the “Brain Octane” MCT product from Bulletproof. It is a very different product than their “XCT” aka regular MCT oil. I was wondering if anyone has or had a reply to Wendy’s concerns that after she started putting Brain Octane, butter and collagen in her morning coffee she started gaining in her tummy and thighs; can anyone answer or explain the reasons for that on a small built woman of 110 lbs? Hi. Can one take MCT oil if pregnant or lactating? Please correct me if I’m wrong, but I believe MCT oil is derived from coconuts. I have not tried MCT oil because this. I have a severe sensitivity to coconut oil, specifically. Other coconut products seem to be OK but not the oil or the coconut butter which also contains the oil. Can you tell me if I am correct about it being derived from coconut? Hi! Was wondering if you can take mct oil and probiotics at the same time? Be careful. My sweet, precious grandson died due to a fatty oxidation disorder called MCAD. (Medium-chain acyl-CoA dehydrogenase deficiency) His body could not break down medium chain fats. Two other grandchildren are carriers of this awful genetic disorder. Coconut can be deadly for people with this disorder. SUCH GREAT INFORMATION!, TRYING TO LOSE WEIGHT & GET HEALTHY.